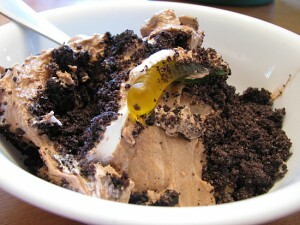 Dirt Pudding recipe by Maria at DesiRecipes.com. First make thick vanilla custard/pudding which should be around 4-5 ounces. Make sure the custard/pudding is thick and cool it first. Blend coolwhip cream, creamcheese, and butter together. Make sure they are not melted when you are blending them. These ingredients should be a little soft but not melted in anyway. Room temperature should be fine. Blend them well removing all lumps. Afterwards, add the pudding in this mixture and mix well. Crush the Oreo cookies in a chopper without adding anything. Take a bowl and layer it with the pudding first and adding the crush cookies after the layer. The top layer should have the cookies. Refrigerate for about 2-3 hours and serve chill. Enjoy this great dessert which kids cannot seem to get enough off :).